UFO SIGHTINGS DAILY: NASA Saving Curiosity Rover MASTCAM Images At Only 70% Quality?? May 2015, UFO Sighting News. 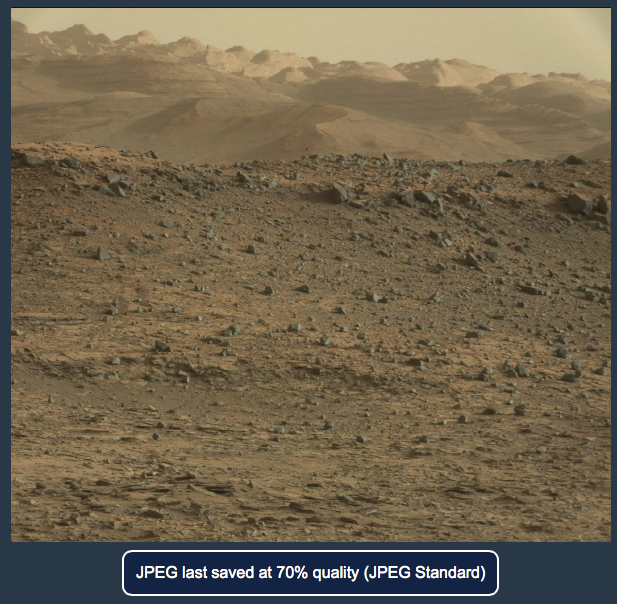 NASA Saving Curiosity Rover MASTCAM Images At Only 70% Quality?? May 2015, UFO Sighting News. If anyone can answer why we only get to see 70 percent of quality of the original images I would love to hear it! I have always loved the MAHLI images when enhancing them and now I understand why. The 25 extra percent between 7 and 95 percent makes a major difference when you only have around 1000 X 1000 original pixels to work with! I would like to see all images that are labeled RAW IMAGES be an actual RAW IMAGE that has not had any of the quality cut in any shape or form. Maybe I am wrong here or making a big deal out of nothing but just a little FYI and something to take a look at!